This week, New York sensation Dorrance Dance bring their exciting mix of Tap and electronic music to Sadler’s Wells. 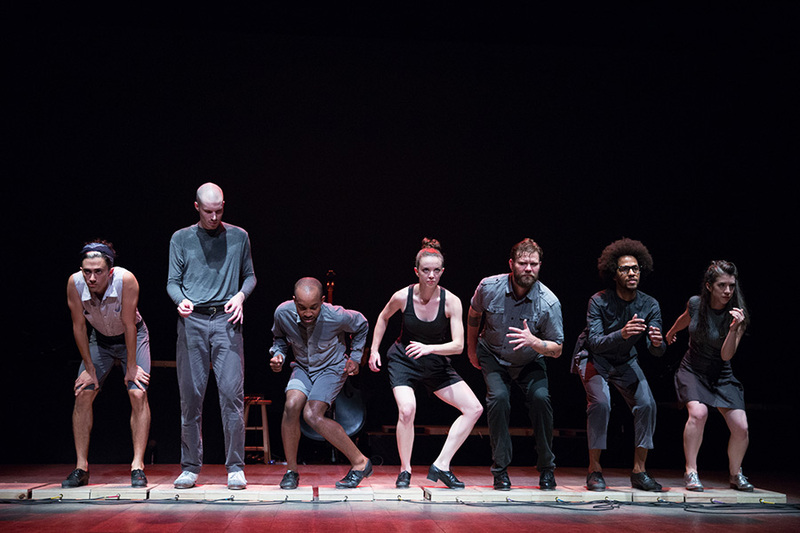 In their performance, ETM: Double Down the whole stage becomes one big band with the use of Nicholas Van Young’s pioneering electronic tap boards. Nicholas the ‘technical wizard’, dancer, choreographer, musician and master teacher talks to us about his revolutionary triggers. The boards are electronic drum triggers, made from 3/4inch birch ply. The triggers themselves are piezo transducers which have been used in electronic drums for years. They are cheap and responsive and have proven to be resilient to the abuse of tap dance and travel. They are also easy to repair while on the road. Tap dancers have been experimenting with triggers since the 70’s but nothing has been done to this scale or this format. Not to mention the software and hardware to interact with them has become limitless in its potential. I had spent a few years experimenting and performing with a solo compositional instrument, looping different sounds to create music, effects and soundscapes. One of my dreams was to create a playable set for multiple dancers so we could play more complex compositions in real time without looping. Developing the boards and the set were easy. Learning to interact and choreograph within the set was where the brainstorming and creative work was/is at play. While most of these techniques are common in the percussive world, they are not used often or with much success in the percussive dance environment. It takes patience and tenacity to do the research and to work through the inevitable problems that arise. I think it’s safe to say everyone has a different experience with this show (ETM: Double Down). While some marvel at the integration of technology and sound manipulation, others might not even notice that it’s there. When the momentum picks-up, I think most have forgotten the details and are immersed in the emotional and musical complexities of the show. Its seamlessly integrated. Unless of course there is a technical malfunction. In which case it is undeniably human, and honest. We use the boards as an extension of our sound pallet to create compositions. They pick up the unique movement that innately evolves when dancing with them. 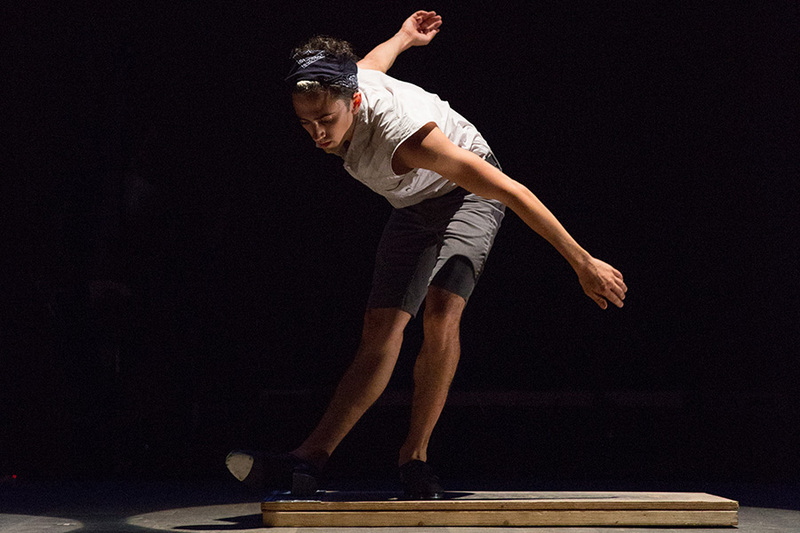 Dorrance Dance does not manipulate the sound of the tap dance itself. Instead we create music where the voice of our taps against wood become the music. They extend our voice into new realms of expression. They allow us to experiment with an infinite world of sound. They also challenge us to dance and create in a new way that is dedicated to this process. One of the most exciting moments is our finale. Besides being a dynamic and explosive piece, it is also the moment when all elements come together: acoustic and electronic, melodic and percussive, technical and emotional. It is the destination. What is it that excites me about Tap? Everything. The common answers of simultaneously being the musician and the dancer, its rich ties to roots and history, it being an improvisational jazz based art form. These are true to all of us. We all share that as a family. We are the biggest fans of our art. It is cutting edge always, constantly pushing its own boundaries technically and artistically. It thrives as a solo, and as an ensemble practice. As an American folk art, and as a path to personal discovery. Everything! Dorrance Dance are at Sadler’s Wells with ETM: Double Down from tomorrow until the 15 July.